This chapter identifies and examines the field of power inherent in the child protection system which works to constrain and enable children’s participation in child protection interventions. 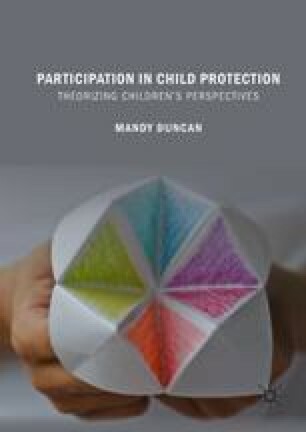 It argues that the key purpose of the child protection system is to protect children from harm and this in itself is an explanation for why protection is consistently prioritised over participation as this is what professionals are accountable for. It explains how child protection professionals become enculturated into professional systems of thought and employ the discourses and conceptual tools that are available to them. Children do not have full command of these discourses; thus, adults are privileged and children subordinated within the system. The chapter reveals the mechanisms which are employed both consciously and subconsciously by professionals to control children within the child protection system.